Some of you may have noticed, but in addition to keeping up my personal style blog, after a few months I will have another key responsibility in my life. Yes, you got it right – I am an expecting mom, whose belly is starting to grow bigger and bigger each day. As you probably assume, in the next few months Purely Me will be relatively focused on pregnancy style. However, I will continue posting about fashion trends, beauty tips, travel and everything similar that will be of interest for the non-pregnant of you. For this post I’ve chosen to combine dots and stripes, retro feeling and seaside elements. 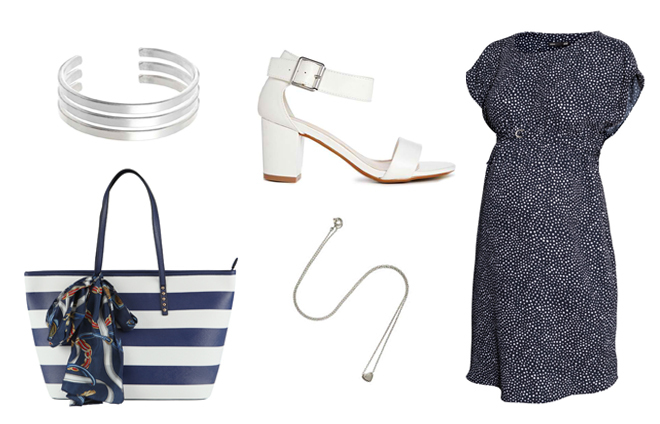 I am wearing an H&M dotted maternity dress in navy, ALDO bucket handbag in white-blue stripes, white chunky-heel sandals, ACCESSORIZE bangle bracelet, as well as ACCESSORIZE heart necklace and earrings. information, but good topic. I must spend some time learning much more or working out more. You look so nice and congratulations. I really like those shoes. Great photos. Congratulations on your exciting news! You look fantastic- love the chic navy and white!